Home » Blogs » brad's blog » Will bed-bound seniors experience the world through VR telepresence robots? Will bed-bound seniors experience the world through VR telepresence robots? I've written before about my experiences inhabiting a telepresence robot. I did it again this weekend to attend a reunion, with a different robot that's still in prototype form. I've become interested in the merger of virtual reality and telepresence. The goal would be to have VR headsets and telepresence robots able to transmit video to fill them. That's a tall order. On the robot you would have a array of cameras able to produce a wide field view -- perhaps an entire hemisphere, or of course the full sphere. You want it in high resolution, so this is actually a lot of camera. The lowest bandwidth approach would be to send just the field of view of the VR glasses in high resolution, or just a small amount more. You would send the rest of the hemisphere in very low resolution. If the user turned their head, you would need to send a signal to the remote to change the viewing box that gets high resolution. As a result, if you turned your head, you would see the new field, but very blurry, and after some amount of time -- the round trip time plus the latency of the video codec -- you would start seeing your view sharper. Reports on doing this say it's pretty disconcerting, but more research is needed. At the next level, you could send a larger region in high-def, at the cost of bandwidth. Then short movements of the head would still be good quality, particularly the most likely movements, which would be side to side movements of the head. It might be more acceptable if looking up or down is blurry, but looking left and right is not. And of course, you could send the whole hemisphere, allowing most head motions but requiring a great deal of bandwidth. At least by today's standards -- in the future such bandwidth will be readily available. If you want to look behind you, there you could just have cameras capturing the full sphere, and that would be best, but it's probably acceptable to have servos move the camera, and also to not be sending the rear information. It takes time to turn your head, and that's time to send signals to adjust the remote parameters or camera. Still, all of this is more bandwidth than most people can get today, especially if we want lifelike resolution -- 4K per eye or probably even greater. Hundreds of megabits. There are fiber operators selling such bandwidth, and Google fiber sells it cheap. It does not need to be symmetrical for most applications -- more on that later. At this point, you might be thinking of the not-very-exciting Bruce Willis movie "surrogates" where everybody just lay in bed all day controlling surrogate robots that were better looking versions of themselves. Those robot bodies passed on not just VR but touch and smell and taste -- the works -- by a neural interface. That's science fiction, but a subset could be possible today. One place you can easily get that bandwidth is within a single building, or perhaps even a town. Within a short distance, it is possible to get very low latency, and in a neighbourhood you can get millisecond latency from the network. Low latency from the video codec means less compression in the codec, but that can be attained if you have lots of spare megabits to burst when the view moves, which you do. So who would want to operate a VR robot that's not that far from them? This disabled, and in particular the bedridden, which includes many seniors at the end of their lives. Such seniors might be trapped in bed, but if they can sit up and turn their heads, they could get a quality VR experience of the home they live in with their family, or the nursing home they move to. With the right data pipes, they could also be in a nursing home but get a quality VR experience of being the homes of nearby family. They could have multiple robots in houses with stairs to easily "move" from floor to floor. What's interesting is we could build this today, and soon we can build it pretty well. One problem with using VR headsets with telepresence is a camera pointed at you sees you wearing a giant headset. That's of limited use. Highly desired would be software that, using cameras inside the headset looking at the eyes, and a good captured model of the face, digitally remove the headset in a way that doesn't look creepy. I believe such software is possible today with the right effort. It's needed if people want VR based conferencing with real faces. One alternative is to instead present an avatar, that doesn't look fully real, but which offers all the expression of the operator. This is also doable, and Philip Rosedale's "High Fidelity" business is aimed at just that. In particular, many seniors might be quite pleased at having an avatar that looks like a younger version of themselves, or even just a cleaned up version of their present age. Another alternative is to use fairly small and light AR glasses. These could be small enough that you don't mind seeing the other person wearing them and you are able to see their eyes direction, at most behind a tinted screen. That would provide less a sense of being there, but also might provide a more comfortable experience. For those who can't set up, experiments are needed to see if they can make a system to do this that isn' t nausea inducing, as I suspect wearing VR that shifts your head angle will be. Anybody tried that? Of course, the bedridden will be able to use VR for virtual space meetings with family and friends, just as the rest of the world will use them -- still having these problems. You don't need a robot in that case. But the robot gives you control of what happens on the other end. You can move around the real world and it makes a big difference. Such systems might include some basic haptic feedback, allowing things like handshakes or basic feelings of touch, or even a hug. Corny as it sounds, people do interpret being squeezed by an actuator with emotion if it's triggered by somebody on the other side. You could build the robot to accept a hug (arms around the screen) and activate compressed air pumps to squeeze the operator -- this is also readily doable today. Barring medical advances, many of us may sadly expect to spend some of their last months or years bedridden or housebound in a wheelchair. Perhaps they will adopt something like this, or even grander. 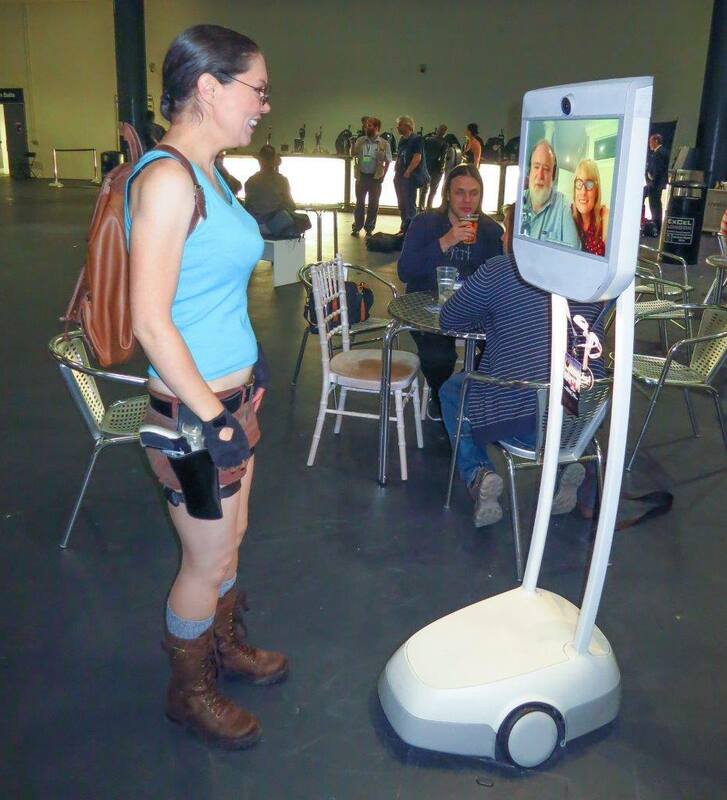 And of course, even the able bodied will be keen to see what can be done with VR telepresence. Is that a picture from the reunion? The woman with the gun in the holster---some sort of cosplay, or just par for the American West course? No, that photo is from the other event in the link, and yes, she is cosplaying as Lara Croft.